The newly developed District Wharf, a jewel on the banks of the Potomac, is helping to make D.C. the capital of cool. 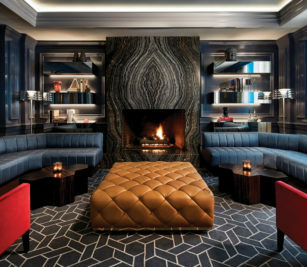 A lounge at the Ritz-Carlton. Photo courtesy of the Ritz-Carlton, Washington D.C.
Our nation’s capital doesn’t always get a lot of love. Built along a swampy section of the Potomac River, it’s historically been thought of as hot and muggy in the summer and rife with government drones and graft the year ’round. The Trump administration hasn’t helped its reputation: The Right thinks of the seat of government as a swamp; the Left thinks of it as the victim of a hostile takeover. But there’s a big difference between Washington, D.C., site of our sprawling federal bureaucracy, and Washington, D.C., the nearly 700,000-person city of beautiful neighborhoods and long-standing ethnic diversity. The city has been undergoing radical changes in recent years, becoming more cosmopolitan, more inviting, more fun. 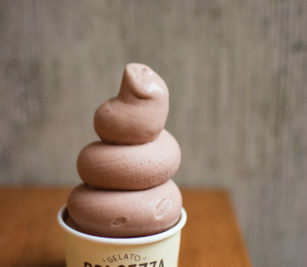 Even—dare we say it?—a little bit hip. Take, for instance, the National Mall, that 146-acre expanse of grass extending from the Capitol to the Lincoln Memorial. The instantly acclaimed Smithsonian National Museum of African American History and Culture opened in 2016 to great fanfare on the Mall’s penultimate plot of land, and PeaceTech Lab, a tech incubator devoted to reducing global conflicts, opens this summer. The Lab is located in the Mall’s final developable location, a former Navy hospital next door to the United States Institute of Peace. Two years after the African American History and Culture museum debuted, a line of visitors still stretches beyond the museum’s front doors, and its exhibits—starting with the harrowing days of slavery, Jim Crow and the Civil Rights movement on the lower levels and rising up to a glorious celebration of African American art, culture and music on its top floor—are choked with visitors. The District’s population, until 2011, was majority African American, and the new museum is a visible monument to this heritage in a can’t-miss location. A short Lyft ride away, in some of D.C.’s tonier environs, the bars at the Ritz-Carlton (now serving an unusual flight of “sound-aged” whiskys) and Blue Duck Tavern (part of D.C.’s years-long food renaissance) are full of lobbyists and government contractors. No surprise there. But instead of working for defense contractors or the oil and gas industry, these patrons seem to skew toward the Bay Area’s tech giants. On a late June evening, in between the NBA Draft and World Cup rumblings, the barstool chatter was all about technology, ethics and what role government should or shouldn’t play. The rising importance of the tech sector in D.C., and the front-and-center position of African American culture and history, hint at larger structural and cultural changes in the city. A period of economic prosperity and cultural vigor, passionately cheer-led by then-president Barack Obama, has led to the reinvention of once-dormant and/or dangerous neighborhoods—Logan Circle, Bloomingdale, the H Street Corridor, Penn Quarter. Downtown D.C., once a ghost town at night, now bustles with people who not only work, eat and drink, but actually live there. And Washington has, somewhat quietly, transformed itself into a sports mecca: Its professional teams include the Redskins, the Washington Nationals (baseball), D.C. United (soccer), the Stanley Cup-winning Capitals and the NBA’s Wizards. Particularly around the Capitals’ downtown Capital One Arena and the neighborhood-transforming Nationals Park, there’s a new swagger in Washingtonians’ steps. The city’s revitalization hasn’t benefitted all of its residents equally; gentrification has pushed many African Americans to the city’s margins, a bitter irony in a town once fondly known as “Chocolate City” by its African American residents. (In the post-World War II years, Washington was a place where Southern blacks could migrate and find good work and, except for the heavy-handed political oversight of white Southern Republicans in Congress, a generally welcoming culture.) But Norton, a civil rights veteran who was born in D.C., doesn’t see the Wharf as a driver of gentrification. “What it’s done is create an entirely new neighborhood in the nation’s capital,” she says. And, really, she adds, where in the world is waterfront property affordable? The Wharf has transformed Southwest, a previously underused and scarcely populated area. The Wharf has transformed Southwest, a previously underused and scarcely populated area. This quadrant was orphaned from the rest of the city during the first big push of so-called urban renewal in the 1950s. A freeway cut it off from the surrounding neighborhoods, and thousands of its buildings were knocked down, replaced by brutalist housing complexes and office buildings, including some low-on-the-totem-pole government agencies like the EPA. In the process, some 23,000 people and 1,500 local businesses were displaced, according to the DC Preservation League. Redeveloping the area, though, was a challenge. It took several acts of Congress—due largely to Norton’s hard work—to secure land and water rights from the federal government. Also needed: negotiations with community leaders and private deals with the holders of 100-year leases that had turned the waterfront into Swiss cheese back in the ’80s. During the decade-plus that it took for phase one to be completed, developers went bankrupt in the financial crisis, and zoning and buildings rules had to be redrawn. The Wharf required tweaking some of the very fundamentals of D.C.’s historical urban aesthetic. “Washington was designed by a French architect, [Pierre Charles] L’Enfant, and the blocks are very, very long,” says Amer Hammour, chairman and founder of Madison Marquette, which partnered with PH Hoffman in the Wharf development. “The office buildings don’t have atriums and plazas. There’s a lot of interior space, but they don’t have a lot of light.” To make the Wharf more inviting, Hammour and Hoffman divided what would traditionally be a six-block, mile-long section of waterfront into 13 shorter blocks. 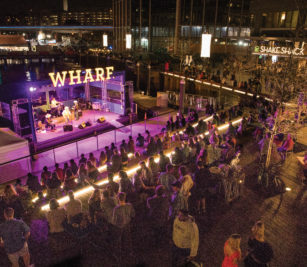 Although it’s been open less than a year, the Wharf is already a success. Buyers have snapped up almost 100 percent of the 220 condos in the recently completed first phase of construction. The rental units are also close to capacity. The development is anchored on one end by a cluster of fish markets, the oldest in the country. Stroll along the waterfront, and you’ll pass the Anthem—a music venue that holds 6,000 and books surprisingly edgy acts (comedy rock duo Tenacious D graced its marquee in June). You’ll see Dolcezza Gelato, a coffee shop that serves a wicked brew and gourmet biscuit sandwiches, the InterContinental Hotel and the Capital Yacht Club (it’s been on the same section of the Potomac for more than 100 years) and end up at Del Mar de Fabio Trabocchi, a magnificent Spanish seafood restaurant favored by the Obamas. The stretch is anchored by Hyatt House and Canopy by Hilton, a new hotel brand targeting millennials. That’s just a taste of the offerings: The Wharf boasts some 30 restaurants and bars, including a rum distillery, and is chockablock with music venues and outdoor activities. Water taxis run up and down the river, connecting the Wharf to nearby golf and to Georgetown, just a short, traffic-free ride away. The Pentagon, Washington Monument, Reagan National Airport and Jefferson Memorial are all easily accessible. Stand there long enough and a helicopter bound for the White House will invariably zip past. The sight is always dramatic—but these days, it’s not the most exciting thing happening in Washington, D.C.
Where to work, play and invest in Washington, D.C.